The view inside mission control on the Nautilus, the research vessel that will be studying microbial life at the seafloor on Lo'ihi Seamount, an active volcano in Hawaii, in August 2018. Astrobiologists want to snorkel in the hidden oceans of icy moons that may have the potential to host life. But, of course, research trips to these distant worlds are awfully difficult to coordinate. So, as a consolation prize, they're going to Hawaii. But these scientists aren't going for the sandy beaches and verdant foliage. Instead, they are visiting the seafloor off the coast of the Big Island at a place called Lo'ihi, where what will one day become the newest island in the archipelago is being born. They hope this harsh environment will mirror that found on Jupiter's moon Europa and Saturn's moon Enceladus, giving them clues to what kinds of life might be hiding there (that is, if there's life there at all). "There's just opportunity here galore," said Darlene Lim, principal investigator of the new mission and a geobiologist at NASA. That's true both for the scientists who will be working on the mission and for the public, who is getting the rare chance to see live footage from the seafloor. "You're going to see what we're going to see," Lim told Space.com. 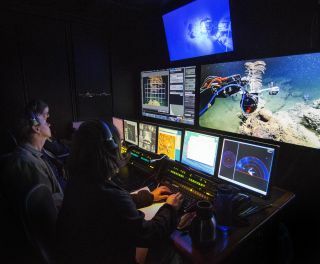 The expedition, called Systematic Underwater Biogeochemical Science and Exploration Analog, or SUBSEA, is a joint endeavor among NASA, the National Ocean and Atmospheric Administration (NOAA) and a nonprofit organization called the Ocean Exploration Trust. They've assembled a broad team of experts, including microbiologists, astrobiologists, geologists and planetary scientists. But as with many oceanography expeditions, there's only one research vessel. And after all the people needed to pilot the ship and its robotic explorers, there were only half a dozen spots left for scientists. "Research vessels are getting smaller; it's harder to get funding to go to sea," Nicole Raineault, expedition leader for SUBSEA with the Ocean Exploration Trust, told Space.com. That's where telepresence comes in — reaching out to scientists before the expedition to become "doctors on call," so to speak, who watch livestreamed footage and chime in remotely. "It would either be by luck that you had the right expert on board, or they would have to go by best gut instincts," Alan Leonardi, director of ocean exploration and research at NOAA, told Space.com. But with telepresence, that's no longer the case — and distant experts can subtly influence immediate decisions in the mission, potentially deepening the science that can be done. One of the two remotely operated vehicles that will be studying the seafloor off the coast of Hawaii in August 2018. Telepresence isn't just a clever response to the constraints of boat space; it's also a surprisingly good model for what it's like to work on a mission in deep space. Next year, the team will even institute a Mars-like communication lag to get more authentic practice in controlling robots in other parts of the solar system. It's not just the mission format that makes SUBSEA so intriguing to planetary scientists; the destination is a draw as well. Scientists have studied plenty of hydrothermal vent systems, but all of those systems have been located at plate boundaries, where giant chunks of Earth's crust are slipping apart. Not so at Lo'ihi, where the SUBSEA expedition is taking place. Lo'ihi is a seamount being built by the same hotspot that created the Hawaiian islands, and, therefore, should better mimic the geologic underpinnings of a place like Enceladus. "We chose Lo'ihi as this opportunity to really have a portal to another ocean world system," Lim said. "It's the first time that any crew has ever gone out to examine Lo'ihi from this kind of lens." Specifically, scientists will be focusing on studying the environmental characteristics of the seamount itself and the communities of microbes living there. "As microbiologists, we're really interested in what types of microbes are there and what they might be doing," Amy Smith, a microbiologist at Woods Hole Oceanographic Institution, told Space.com. "We're just basically looking for who's there, what are they doing there, how are they making a living." She's particularly interested in finding out whether any critters can use hydrogen as a source of energy, since that molecule can be found below the ice of Enceladus. In addition to studying microbes at the site, she'll also take samples for genetic testing and gather specimens to try to grow in her lab. "Since this environment is similar to what we might find, we predict, on other ocean worlds, we're hoping to get some answers as to what kinds of life might be there," Smith said. The Nautilus research vessel will livestream footage to scientists and the public. But the mission isn't just about biology, and the geologists on board got particularly lucky with the timing of the mission, given nearby Kilauea's exceptional uptick in activity that began in May. "It's also pretty cool because we're going to be the first team to get eyes on Lo'ihi, since this very active eruptive period began on the Big Island," Lim said. That should let them see how far lava has traveled and how it has shaped the seafloor. Will it work? You'll have to tune in to the livestream to find out. Smith noted, however, that this isn't a lush environment like a coral reef or a more traditional hydrothermal vent, so viewers shouldn't expect to see particularly charismatic creatures. "There's not a whole lot of shrimps or other organisms floating around on it," she said, although there are fuzzy, mat-like structures created by microbes. Even when there's not much to see, there will be plenty to listen to, because the livestream includes a running commentary from experts and science communicators, offering a unique inside look at the expedition and answering questions from the public. "There will be a lot of dialogue about how the sampling is done and why we're choosing particular sites and how they might differ," Smith said. The livestream will continue through Sept. 11, when the research vessel will move on to its next adventure. But until then, it's your chance to explore the ocean floor — and imagine what it would be like to explore even more distant oceans. "I think it's really cool; it kind of gives us an opportunity to act like astronauts," Smith said. "It kind of feels like we're training for a mission and learning how all of it works."